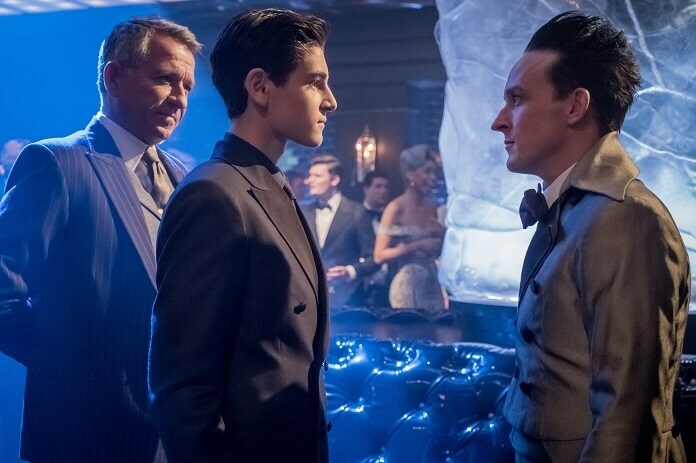 After a two-minute recap of season three that ends with Bruce Wayne (David Mazouz) standing tall on top a building, season four of Fox’s Gotham kicks off with a couple being mugged in an alley. Bruce dons a mask and takes on the muggers, saving their would-be victims. While one mugger is on the ground, he tells Bruce he has a License of Misconduct. As Bruce walks away, he puts his hood back on. Ra’s al Ghul (Alexander Siddig) watches from a doorway. Next up, a wedding reception is interrupted by armed gunman. They demand cash and jewelry, but then Victor Zsasz (Anthony Carrigan) arrives, gets their attention, and the crowd quiets down. He claims he was just passing by, and wants to know if the robbers realize they must be licensed by Penguin to cause trouble now. It’s a new rule in Gotham, but these thugs refuse to back down. Zsasz shoots the leader’s finger off, telling the rest to leave the loot behind. Penguin (Robin Lord Taylor) reports violent crime is down 57% following his take-over of Gotham’s underworld. Meeting with the new underworld boss, Mayor Burke (Larry Pine) says Penguin can’t unionize crime, though he appreciates everything Penguin’s done. Penguin takes credit for making the streets safe, and now only professionals will be committing the crimes under his new License of Misconduct program. And, obviously, he’ll profit from the program. Penguin offers the mayor a choice between an era of calm and prosperity or a return to the crime-ridden old days. The new Police Commissioner (Harry Sutton Jr) says if they agree, they’ll need to deny it to the press. Penguin explains that if a GCPD officer finds someone with a license committing a crime, he will have to let him walk away. The mayor and the commissioner agree to a tiny percentage of the profit for turning a blind eye and unofficially endorsing the program. Jim Gordon (Ben McKenzie) walks into a bar to get his morning coffee just as the owner, Frank, is being robbed. The robber lets Jim see his Penguin-approved License of Misconduct and of course Jim doesn’t care. He arrests the dude and takes his coffee to go. When Jim locks him up at the precinct, the other officers just stare at him in disbelief. Harvey Bullock (Donal Logue) meets with the GCPD bookkeeper and he’s impressed with the numbers Penguin’s promised the department. But, the accountant reminds Harvey all officers must comply and Penguin is, justifiably, worried about Jim Gordon. Harvey guarantees his men will honor the licenses and kicks the accountant out of the office just as Jim walks in. Harvey reminds Jim he’s a homicide detective and doesn’t need to be arresting robbers. He also says the commissioner means business and officers must allow anyone with a card to go free. “Before you get on your high horse, three months ago this city was in a tailspin. We survived because Penguin took control of the underworld,” says Harvey. Jim doesn’t want to go along with the program, but Harvey reminds him no cops have been shot recently and Gotham has to get back on its feet. Jim is worried the citizens will now always trust Penguin more than the cops, and Harvey assures him one day they’ll bust Penguin. Over at Wayne Manor, Bruce wants to turn the program against Penguin and Alfred (Sean Pertwee) warns him to stop thinking that way. Alfred asks if he remembers why he put on the mask and took to the streets, and Bruce says it was Alfred’s teachings that drilled into him there’s no substitute for “real world encounters.” Bruce must be ready for Ra’s return and Alfred says they must hold to that mission. Bruce is still feeling guilty about the fact his finger was on the button to release the virus. Even though he didn’t press it, he feels responsible and needs to make a difference in his city. Alfred tells him to get his priority straight and not have two missions. Bruce believes he can do both – prepare for Ra’s and make Gotham safe. The unlicensed gang makes their way to Arkham and, along with Warden Reed (Damian Young), they visit Jonathan Crane (Charlie Tahan) in his cell. Reed explains the toxin Jonathan’s dad injected him with overloaded his fear response. His mind created a boogeyman that haunts him, and Reed uses it to control Jonathan. They want Jonathan’s fear juice and pay Reed to release him. As he leaves his cell, a drawing of the Scarecrow is revealed on the floor. The gang take Jonathan back to his childhood home and he uncovers a chest full of his dad’s notebooks and chemicals. To keep him under control, they’ve created a scarecrow figure that freaks Jonathan out. Now armed with Crane’s fear gas, the gang rob a bank. After collecting the money, they leave the bank manager in a hysterical state, mumbling about fiery demons. Jim, Harvey, and the cops show up after the robbers have left, and Harvey says these guys didn’t have a license. Jim wonders if they attacked the bank – a public place – because they’re sending Penguin a message. Jim is determined to beat Zsasz to the gang, just to prove the GCPD still matters. Before Jim takes off (and after Harvey threatens to fire him), Gordon reveals he thinks the victims were sprayed with Crane’s formula. Mr. Crane’s dead but his son isn’t, and that’s who Jim believes they should visit for answers. Jim and Harvey visit Arkham and ask Warden Reed about Jonathan Crane. Reed doesn’t want Jim or Harvey to visit Jonathan since his condition is fragile and seeing the men who killed his father might push him over the edge. Jim informs the Warden that Crane’s toxin was used to rob a bank and the people who did it challenged Penguin. If Harvey tells Penguin the Warden’s involved, he’ll send Zsasz in to get answers. Reed admits he was threatened and gives up the name, Grady. Jim and Harvey track down Grady and his gang, but Grady gets the jump on them. Grady tells them he’s an outlaw with a code and doesn’t like Penguin’s program. He believes Penguin’s a criminal who steals people’s livelihoods. They’re determined to show Penguin who’s in charge. And now we catch up with Selina Kyle (Camren Bicondova) who’s wandering through an alley and comes across a gang. They surround her and she asks to be let go. When they don’t allow her to pass, she whips out her whip and easily takes down all but one. Tabitha (Jessica Lucas) finishes off the last one standing, warning Selina not to turn her back on anyone unless she knows they’re down. Tabitha and Selina go for pizza to celebrate a successful training session, returning home to find Zsasz in Tabitha’s place. He’s there to offer them each a License of Misconduct because Penguin thinks it’s time to let bygones be bygones. He invites them to the opening of Penguin’s club where they can pick up their licenses. He warns them it’s an “or else” kind of deal. Selina wants to join Penguin but Tabitha refuses. Instead, she wants to move somewhere they can’t be found. Bruce pays a visit to Jim Gordon at the GCPD headquarters, wanting to know if Jim’s going along with Penguin’s licenses. Jim replies, “Not really,” and Bruce wonders if Penguin might have a master list of criminals who hold the licenses. Bruce suggests that list would include the crimes that have been committed as well as those that have not yet been committed in Gotham. Jim doesn’t believe it’s an avenue that can be pursued since the judges have agreed to Penguin’s program. Bruce suggests Jim could use Penguin to lead him to the unlicensed gang he’s pursuing and then invites Jim to dinner before disappearing. Penguin signals Ivy (Maggie Geha) to light up the centerpiece of the club. 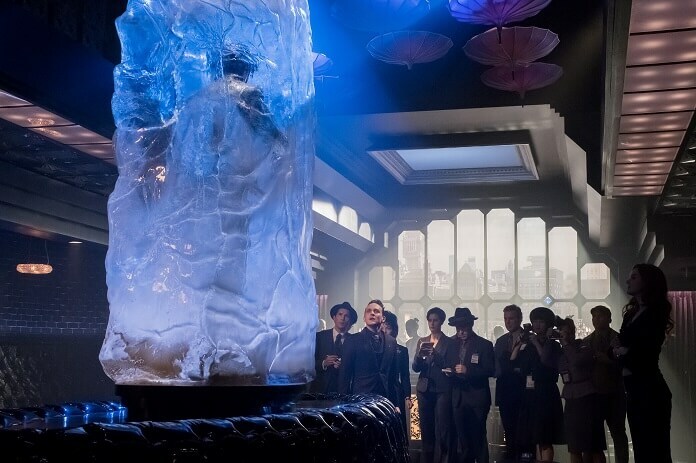 It’s Edward Nygma frozen in ice, and Penguin says he’s been frozen because he has a rare brain disease. Ed begged to be put on display before he was frozen, according to Penguin. Jim Gordon shows up at the press event and asks if Nygma knew he was being frozen. Penguin says he has affidavits from Ed’s doctor, and then asks why Jim’s really there. Jim announces in front of the media that Penguin is a fraud. The gang with Crane’s fear gas is unlicensed and aren’t afraid of him. Other gangs will find out and Penguin’s reign will end. Penguin swears he’ll crush this gang and prove he’s the one who keeps Gotham safe. The threat to destroy the gang is the lead on the local news, and Grady and his men watch as the reporter quotes Penguin as saying they are cowards and pond scum. They’re more determined than ever to take Penguin down as soon as possible. Jonathan Crane is forced to work on more fear gas and then he’s locked up with the creepy stuffed scarecrow. Jim and Harvey organize the cops, laying out the plan to capture the bank robbers when they arrive at Penguin’s club. Jonathan is panicking in a locked room with the stuffed scarecrow. He hears it talk to him and then hallucinates that it attacks him, eyes and mouth blazing fire. Jim’s in the locker room when four officers jump him. They don’t want to go against Penguin since his program has lowered the crime rate. Jim puts up a good fight but he’s outnumbered. Since the cops don’t want to back them up, Jim and Harvey will be on their own at Penguin’s. Bruce and Alfred show up at the Iceberg Lounge party and Penguin greets them warmly. Alfred wants to know if Ed’s still alive inside the ice, and Penguin says they may never know. Bruce catches him in his obvious lie, and says they will find out once the cure for his disease has been found. Bruce thanks Penguin for what he’s done for Gotham, and then asks about the licenses. He wants to know how it works, assuring Penguin anything he says will remain a secret. Penguin can’t believe Bruce would be supportive of licensed crime, but Bruce admits if it had been licensed three years ago, his parents would still be alive. Penguin says he just provides the guidelines and Mr. Penn handles the details. Bruce has the info he needs on who controls the list, but he becomes distracted when he sees Selina. She looks grown up and absolutely stunning. Zsasz also notices Selina’s at the party and confronts her, saying it’s a package deal. Surprisingly, Tabitha shows up just then to say they’re both in. Selina notices Bruce is staring at her and turns away. The bank robbers arrive and they’re in the kitchen waiting to attack. Penguin surprises them first, showing up with Zsasz and other backup. Penguin knew Jim was setting him up, and now he has something special planned for the rogue gang. Selina and Bruce meet up on the roof, and Bruce apologizes for what he said to her at the hospital. Selina’s walking on the roof’s edge and challenges Bruce to do the same if he wants to talk to her. She’s shocked when he does, and when he continues to apologize. Selina doesn’t care that Bruce doesn’t approve of her selecting Tabitha as a mentor. Selina pretends to be wobbly in her high heels on the ledge, but instead of telling her to get down or disapproving, Bruce compliments her on her dress. Alfred arrives just then to tell Bruce they have a situation, and to ask why they can’t just go to the cinema like normal teenagers. Bruce and Alfred arrive back inside as Penguin’s delivering a speech about keeping the city safe. He’s made the gang members kneel and tells his guests that without him, this gang is what Gotham would get: lawless and rampant crime. He wants everyone to know he’s the one keeping Gotham safe, not the GCPD. In front of all of Penguin’s guests, Bruce demands to know what Penguin’s going to do with the gang. Penguin replies, “I do the dirty work no one else will.” Bruce says he understands, but asks him to turn the men over to the GCPD. Penguin believes Bruce has a good heart, but won’t do what he requests. Ivy has slipped away into the kitchen during Bruce and Penguin’s confrontation, and she throws the switch turning off all the electricity. With the lights out, the gang members attempt to escape with the crowd. Penguin is sprayed in the face with the fear gas and he hallucinates an unfrozen, green demon-ish version of Nygma. Jim comes to the rescue and places Penguin’s attacker under arrest. Penguin, panicking over the Nygma vision, hugs Jim and cries. Back at the station, Jim’s still worried about finding Jonathan Crane. Bruce, in his mask and hood, shows up and demands the license list from Mr. Penn. Bruce watches from the roof as robbers break into a house. He accidentally breaks the glass skylight and falls into the building. The GCPD show up at just that moment and arrest Bruce, as the real burglars flee. A gang member who escaped the Iceberg Lounge returns to fetch Jonathan Crane to force him to make more fear gas. However, Jonathan Crane has now transformed into the Scarecrow!